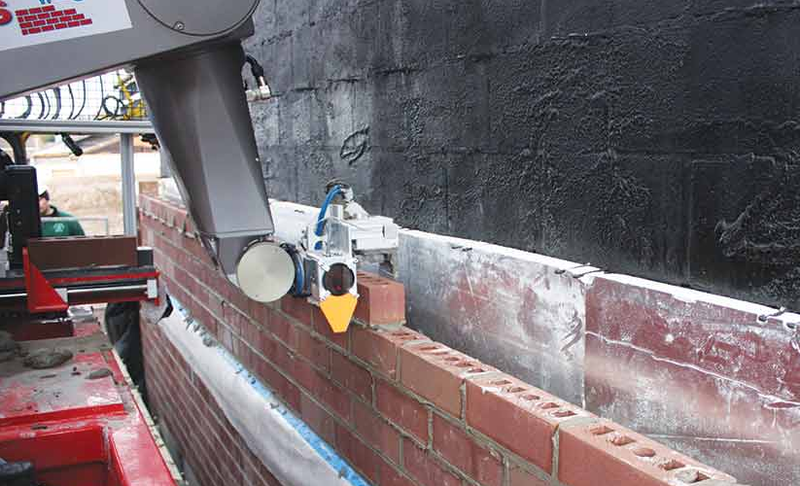 Brick Layering Robots in Construction? If you have braved the hordes of holiday movie-goers, to see The Force Awakens, then you know that the movie contains robots. And not just any robots, but versatile ones at that. They can help pilot spaceships! Track down missing people with holographic maps! And some of them don't seem to have to do anything but be just plain adorable. But do any of these of these robots from that galaxy far, far away do masonry work? No? Then maybe they're not as useful as they appear. Not as useful anyway as a bricklaying robot designed by engineers in Perth, Australia. Admittedly, this robot isn't quite as cute as R2-D2 or B-88. More machine that mechanical person, it appears to be the love child of a crane and a conveyor belt. But what this robot lacks in looks and personality, it more than makes up for in effectiveness and speed. This robot is named Hadrian, after the ancient Roman emperor who unsuccessfully tried to wall invading Scots out of what is now England. This Hadrian brick laying robot is a little more effective. It can lay out the framework of a brick structure in just two days. This equates to laying about 1,000 bricks per hour, meaning that this machine does so at about twenty times the rate of a human counterpart. Another advantage to Hadrian's speed is the fact is that it doesn't get tired or need to take rest breaks. Engineers believe that Hadrian's speedy and tireless work can reduce the total time of home building by as much as six weeks. It's anticipated that while Hadrian is plugging away doing its thing, human workers can be working on and preparing the other components required in home construction. Hadrian's "father" is inventor Mark Pivac, who is the founder of its developing company, Fastbrick Robotics. While some other robotic brick-laying technologies are now available for use in road and wall building, the Hadrian bricklaying robot is not anticipated for sale until 2017. Hadrian's current prototype uses a excavator to get around. But the commercial model will be able to placed on the back of a truck, making this robot even easier to move and use around construction sites. While those Star Wars robots are loveable pals, elsewhere in science fiction, robots have more devious plans. Are Hadrian and its developers likewise planning to take jobs away from human construction workers? Not at all, says Pivac, who anticipates that this brick-laying technology will actually create more jobs, especially in the area of masonry. As with other specialties in construction, qualified brick-layers are aging, retiring, and not being replaced by younger workers. Pivac hopes that this new robotic construction technology will entice a new generation to enter this field. And with Hadrian at their side, Pivac says, these new brick-layers will have a "co-worker" who's non-wasteful and helps to create a safer work site with less noise and other pollutants. To see a demonstration of the Hadrian robot in action, go to this link. Raken provides innovative mobile technology to streamline field workflows for construction workers. Raken's "digital toolbox" connects the field to the office with daily reports, time cards, project insights, photo management, and more. Thousands of the world’s top construction companies use Raken to solve their field reporting needs.